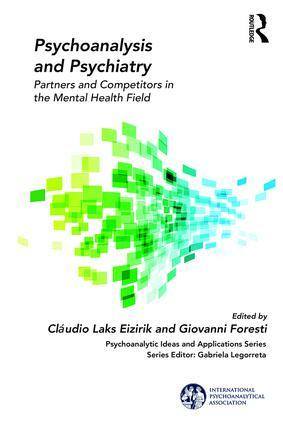 Psychoanalysis and Psychiatry: Partners and Competitors in the Mental Health Field offers a comprehensive overview of the many links between the two fields. There have long been connections between the two professions, but this is the first time the many points of contact have been set out clearly for practitioners from both fields. Covering social and cultural factors, clinical practice, including diagnosis and treatment, and looking at teaching and continuing professional development, this book features contributions and exchange of ideas from an international group of clinicians from across both professions. Psychoanalysis and Psychiatry: Partners and Competitors in the Mental Health Field will appeal to all practicing psychoanalysts and psychiatrists and anyone wanting to draw on the best of both fields in their theoretical understanding and clinical practice. Cláudio Laks Eizirik (MD, PhD), lives in Porto Alegre, Brazil. He is a training and supervising analyst of the SPPA (Porto Alegre Psychoanalytic Society), and teaches at the Institute of Psychoanalysis, and works in private practice as psychoanalyst and psychotherapist. He is Professor Emeritus of Psychiatry at the Federal University of Rio Grande do Sul, where he teaches psychoanalysis and supervises residents of psychiatry. He was President of FEPAL (Latin American Psychoanalytic Federation) and the IPA (International Psychoanalytical Association) and is currently chair of the IPA’s International New Groups Committee. Formerly he chaired the IPA Committee on Psychoanalysis and the Mental Field. He has published books, book chapters, papers, lectured widely and heavily researched his main areas of interest: psychoanalytic training, the clinical practice of psychoanalysis and psychoanalytic psychotherapy, the human life cycle, the process of ageing and the relationship between psychoanalysis and culture. He received the Sigourney Award in 2011. Giovanni Foresti (MD, PhD), lives in Pavia, Italy. He is training and supervising analyst of the SPI (Italian Psychoanalytic Society), works in private practice as a psychoanalyst, psychiatrist and organizational consultant, and teaches at the State University of Milan (School of Specialization in Psychiatry), at the Milan Catholic University (Psychology of Organizations and Marketing) and at the SPI National Institute for Training. He is a member of OPUS, London, and part of Scientific Committee of IL NODO group, Turin. Co-chair for Europe of the Committee "Psychoanalysis and the Mental Health Field," he is now on the IPA Board as European Representative. His interests are focused on clinical issues, institutional functioning and group dynamics.